The Trident Maple, also known as Acer buergerianum, is a deciduous tree that grows to heights of up to 45 feet high and 25 feet wide in its native habitat. With its moderate growth rate, and easy maintenance, it is popular as a patio or street tree as well as being highly valued as a particularly beautiful bonsai specimen. This bonsai is quite hearty, but does require special care to survive well. Trident Maples are highly desired for bonsai due to their small, three-lobed leaved, thick gnarly roots that are perfect for the dramatic root over rock technique and a readily thickening trunk that boasts an attractive orange brown peeling appearance. In the fall, the attractive green of the leaved turns into shades of red, orange and yellow and in the spring, showy yellow flowers are to be enjoyed. Although this bonsai is quite hearty, its roots have a higher than average moisture content and are susceptible to frost damage. This fatal problem mandates that this tree should be carefully protected during the winter. As it does need a dormant season, and does best outdoors, ensure that it is either protected in a cold frame or garage with adequate covering for its roots during extreme cold. The Trident maple prefers full sun and will be most vibrant and successful grown in those conditions. Though this maple is more drought tolerant than other maple species, because it is a bonsai tree, it will still need regular watering. During the hottest days of summer it may need to be watered daily. In the winter you will need to water it less often to prevent damage to the roots from frost. Ensure that your bonsai is placed in well drained soil and that its roots are never allowed to sit in water least it should develop root rot. Young Trident maple trees will need a fertilizer high in nitrogen while older trees need less nitrogen in order to produce the smaller leaves and controlled growth that is preferred in the art of bonsai. During the growing season the Trident Maple bonsai will need frequent fertilizing; once a week for the first month of new growth in the spring and then twice a month after that. As fall approaches, it is necessary to change its fertilizer to one that is lower in nitrogen and higher in phosphorus to help the bonsai prepare itself for winter. Spring is a good time to prune your Trident Maple, because this tree will grow vigorously just before it buds. You can cut back up to 65 percent of the roots to fit its new pot without any damage to the tree, though it is better to cut larger roots instead of the small feeder roots. This tree can be wired at any time during growth, but you will need to remember that the branches tend to be brittle and will also need protection from wire damage. 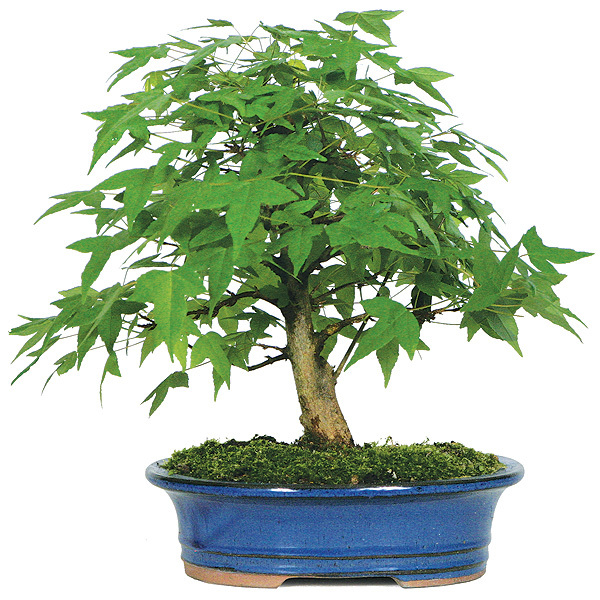 Given ample pot space, this bonsai will grow rapidly so frequent checking of the wire is needed to prevent scarring. Leaf pruning is done in midsummer to reduce leaf size, but should not be done every year because it stresses the tree to lose much of its leaves which contain its stores of energy for the dormant season. Never remove more than 1/3 of the trees largest leaves at a time. If done carefully, this bonsai is perfect for the dramatic root over rock cling style loved by bonsai enthusiasts everywhere. A rock cling is designed similarly to an exposed root, but requires a rock foundation for the roots to wrap around and under. A rock cling bonsai in a pot is a perfect symbol of yin and yang depicting the eternal quality of the universe. This bonsai is very hearty and tends to be pest and disease free though they are sometimes vulnerable to attacks by caterpillars. To deal effectively with this type of pest, it is easy to pluck them off by hand, place them under your heel, and say good bye as you lower it quickly; Nasty, but effective. Cuttings gathered in the early spring will root quiet easily. You can also successfully grow this tree from seed when allowed to germinate naturally. In the fall, simply sow fresh seeds outside in a shallow hole approximately one half inch deep. Once planted, your seeds will sprout in the spring and are ready to be carefully transplanted into a pot taking care not to damage the tiny root system. The best time to transplant your Trident Maple bonsai is in early spring before it begins to bud. Young Maples will need to be given a year or two to become established before re-potting. After this allowance, re-potting should be done about every two to three years. Once the tree has been re-potted, it needs to be kept in a cool, shaded place for about two weeks. If root die back has occurred over the winter, trim off any old roots to allow new growth and re-pot in any well-drained acid soil. Because of its brilliant fall colors, the Trident Maple is a favorite and it is a common practice to defoliate these trees to create the desired effect at times other than autumn alone. It is important to note that defoliation is quite stressful for your tree and it shouldn’t be done unless you must be transplanting out of season, you need smaller leaves or fall colors for an exhibition, or you have bug eaten or damaged foliage. Defoliation shocks the tree into an additional spring growth cycle. If you have determined that this is necessary, a full defoliation is essential for the Trident Maple. Partial defoliation can do serious damage to your tree. To defoliate a healthy, well established tree you simply cut away the leaves with clean scissors. Do not cut off the petiole, or stem, of the leaf. This will allow the petiole to continue providing necessary nutrients to the tree as it recovers from being defoliated. A defoliated tree needs adequate lighting but it will not need as much water until it has developed new buds. Once the tree is bare, you can go ahead with any pruning that is necessary to keep it in the proper shape. Within three to six weeks you will begin to see new leaves which will be smaller than the previous ones.